Think about it. For a mouse trap to perform, all component parts—namely, trap, spring, hammer, holding bar, platform—must be present and operate as designed. If but one is missing, or defective, the mechanism cannot perform its function. Put another way, the mechanism is the irreducibly complex work of a designer. Similarly, the American Miracle is a complex balancing act of converging happenstance orchestrated by the Hidden Hand of Providence. Historian-author Michael Medved argues that, on all counts, the rise of the American Republic qualifies as a miracle. Not all were scoundrels, but counted among our nation’s architects were megalomaniacs, agnostics, deists, revolutionaries, womanizers, drunks, and opportunists, many of whom overcame Achilles’ heels to fulfil noble missions. Had one of them discounted some crucial intersection of America’s journey, the Republic itself would have failed. Instead, a succession of impeccably timed acts of nature, coincidences, concessions, and answers to prayer disclose Master design. Looking back (the 1580s, to be precise), each of three, well-supplied attempts to settle Roanoke Island failed dismally; nevertheless, Calvinist Christians took their chances on yet another perilous Atlantic crossing. Coated in ice, the Mayflower landed at Plymouth Harbor, 250 miles north of its original Manhattan destination. Even before disembarking, the Pilgrims pledged their faith in self-government. Had these adventurers perished, or settled elsewhere, history surely would have taken a turn. Both the Revolutionary War and Civil War prompt what-if questions. For its vulnerability, New York was targeted by British aggressors. Insurgents faced lightning strikes, ensuing fires, and a cold, soaking rainstorm. To their wonderment, an imposing black cloud appeared, then began to swing round-and-round as would a horizontal wheel. Quite unexpectedly, the downpour discouraged General Howe from moving forward. Settling and dispersing at opportune moments, a very dense fog rendered the redcoats visible, thereby assisting General Washington’s successful retreat. Remarkably, not a one was killed or seriously injured. Keep in mind the American Revolution was a world-shaking conflict that created a wholly unprecedented, self-governing federal republic that to this day has not only endured, but also prospered, under the same basic blueprint. Stunningly, America’s second and third presidents, Adams and Jefferson, both died on Independence Day, fifty years (to the day) from this extraordinary nation’s founding. Had circumstances surrounding the revolution, or its outcome, been different, the Miracle of America would never have happened. Brooklyn poet Walt Whitman paired Lincoln’s 1860 election with spectacular, unprecedented, seemingly supernatural cosmic events—not least of which an exceedingly rare astronomical phenomenon known as a meteor procession, only four of which have been identified in earth’s entire history. Though Civil War threatened its extinction, the Union prevailed. Quite serendipitously, General McClellan became beneficiary of the greatest security leak in American military history. Though known for suffering “a bad case of the slows,” General McClellan moved with unaccustomed determination.The lost dispatch of intercepted orders effectively halted Lee’s march north and ranked Antietam among the most consequential military encounters ever. This is but one of many accounts testifying to a Hidden Hand at work on the battlefield. Among America’s curious, unlikely, but destiny-enabling allies included a Native American, pirates, a former slave, a war-mongering despot, and a “Defiant Peacemaker”! Each played a pivotal role in the Manifest Destiny of our nation. Schooled in biblical beliefs while abroad, Squanto was likely the only Indian on the continent who had mastered European agricultural technique that, with his help, rescued the new colony from hunger and privation. Even before he confessed, as his own, the White Man’s God, Squanto was an acknowledged “gift of God” to the colonies. In 1811, John Quincy Adams wrote his father, former President John Adams, “The whole continent of North America appears to be destined by Divine Providence to be peopled by one nation, speaking one language, professing one general system of religious and political principles, and accustomed to one general tenor of social usages and customs.” The resonant term “Manifest Destiny,” thusly described, made its first appearance after Andrew Jackson won the White House. Bearing anti-pirate prejudice, General Jackson outflanked the British enemy by forging a curious alliance with Barataria Bay pirates! Unbeknownst to many, the slave struggle in the Caribbean, led by self-educated Haitian revolutionary and former slave Toussaint Louverture, played a singularly decisive role in securing our nation’s future greatness. 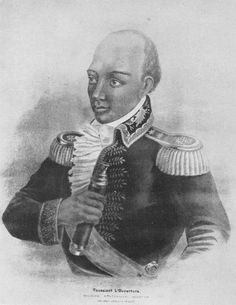 Having led history’s sole successful slave rebellion, this so-called “Black Napoleon” blocked a French army from reoccupying the Mississippi Valley in an effort to seize the center of the North American continent. The original Napoleon Bonaparte gained notoriety, not by giving away, but rather by conquering, territory for his motherland. Inexplicably, he set in motion the largest in history, single-stroke transfer of land that presented the U.S. with a vast track of land four times the size of France. Literally doubling our nation’s breadth, the Louisiana Purchase signaled America’s most beneficial coup since signing the Declaration of Independence. When Mexicans rejected the Rio Grande as rightful line dividing their nation from ours, a West Point man and former aide of Thomas Jefferson, Nicholas Trist, was tasked with settling the border issue. In signing final documents that ended the Mexican War and awarded California to the U.S., Trist outright defied President Polk (1848). Scarcely a week before California formally passed to the U.S., gold was found! Quelling the President’s ire, the Gold Rush sparked one of the world’s most spectacular examples of wealth creation, thereby forging America’s huge expansion the second half of the century. Few appreciate how close founders came to failure in drafting and ratifying the Constitution. Enjoining colleagues at the Constitutional Convention to acknowledge the God who governs in the affairs of men, Benjamin Franklin issued an earnest call to prayer that signaled a demonstrable turning point in the contentious debate. Without foresight of a silent founder, Daniel Jenifer, the Constitution would not have been ratified. You see, Jenifer uncharacteristically absented himself from a crucial vote so that saving compromise might be reached. In 1815, Ursuline nuns engaged in an all-night prayer vigil whereupon their convent remained untouched by British combatants. Seemingly from nowhere, a stiff breeze arose and drove thick fog into rapidly dissolving patches, thereby exposing “redcoats” with glinting bayonets. After less than an hour of fighting, British forces abandoned the field. Secretary of War James Monroe marveled that “history records no example of so glorious a victory obtained with so little bloodshed on the part of the victorious.” The unforeseen outcome baffled observers on both sides. Incredibly, American bodies were not among the thousands lying dead. In his Farewell Address, President-elect Abraham Lincoln called upon “that Divine Being” who attended and assisted him; furthermore, he appealed to the God who acts in history—using even the “accidental instrument” Lincoln characterized himself to be. As president, Lincoln kneeled before Almighty God and prayed earnestly for victory in Gettysburg. “A sweet comfort” ensued, and the rest is history. In his Inauguration Address, Lincoln spoke of “malice toward none; charity for all” in “binding up the nation’s wounds”—timely words for his day and ours. The Bible affirms that, when righteous leaders assume authority, their people naturally rejoice. Notwithstanding, despite egregious failings of men, God works for good “to them that love Him” and who are “called according to His purpose.” My hope is this: May the flawed, floundering, yet favored rise of our beloved Republic continually arouse American believers to embrace their noble heritage and, by God’s grace, to influence its lasting legacy.